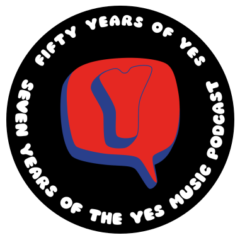 The fifty-fifth episode of the Yes Music Podcast featuring an imaginary dinner party conversation. Listen and see if you would say the same as me. Then let me know what suggestions you have for where to start – or not to start – with Yes music. Contact the show via any of the different routes on the right hand side or by leaving a comment below! How would you convince dinner party guests to listen to Yes music? Where would you recommend new listeners to start? How would you defend Yes music and progressive rock? Hi Paul and thanks for the comment. We are very fortunate in the UK to have the BBC who have just about been able to play some Yes in every decade. The BBC have always had champions of great music and are state-funded so don’t have to rely on adverts. I agree about Silent Wings of Freedom – as you know, Tormato has always been my favourite. Perhaps you are right that this track might be a good way in for some. I’m sure you’ll agree that there was plenty of rubbish around in the 1970s-2000s but, yes, you are right, it is now possible to make poor singers and musicians sound much better with technology. This is a great shame when ‘real’ musicians can struggle to find an audience. Maybe the music which will survive into the next decade and century will be the good stuff, though – I certainly hope so. A great improvisation for a show, Kevin. Very enjoyable. I think you missed the obvious introduction to Yes for Hard Rock/Blues Rock fans though – The Yes Album. The opening of Yours is no Disgrace is as powerful as anything Zep produced and leads the hard rock fan off into new territories. Follow that with (The) Clap and anyone who’s become familiar with Page’s layering of guitars will be staggered that all that sound can come from just one instrument. I was a big Zep (and like you, Queen) fan whe at 19 Ifirst heard the album (actually Disgrace seemed so immediately familiar I can’t help but think I must have heard it before, but not known where). It immediately expanded my horizons and had me hooked. Thanks, Tim, it’s great to know you enjoyed the episode. Fascinating what you say about the hard rock credentials of the Yes Album. I certainly missed that one! I can see exactly what you mean and will listen again to that album! Great point about introducing fans of other prog via Madrigal – once again, that was a serious omission on my part. Thanks. Forums – yes I have considered it many times. I really don’t want to step on the toes of YesFans.com but if it’s set up well, I don’t think it would have to do so. Thanks for the suggestion and I will give it some more thought. I know other podcasts don’t go down that route until they have quite a few comments per episode but maybe we are almost there!